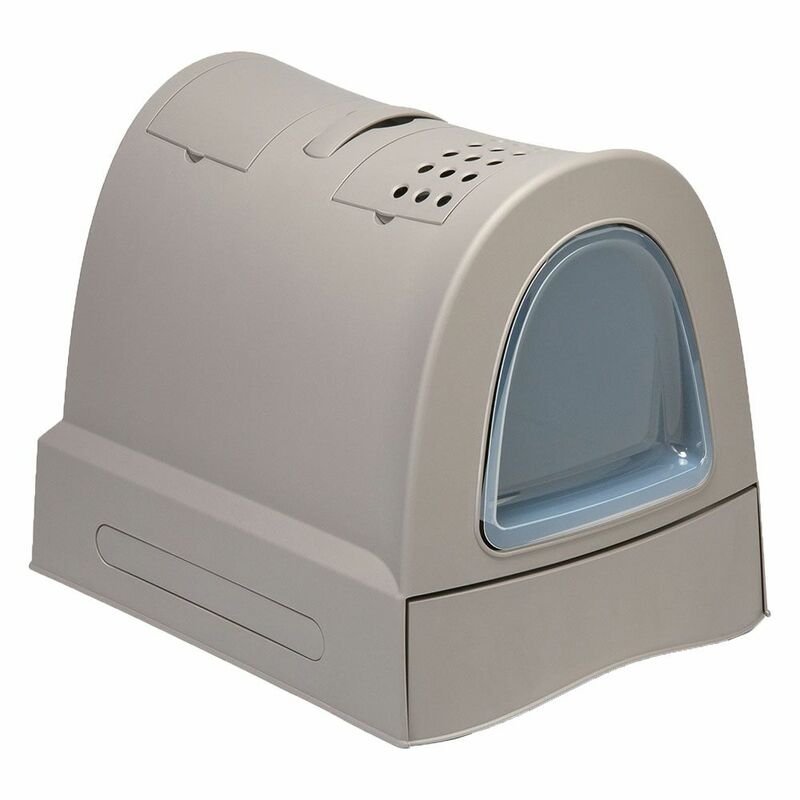 The IMAC Zuma Cat Litter Tray offers a relaxing place for your cat to do its busineΒ! Thanks to its spacious inside and large, transparent swing door, even large cats have sufficient space. A particular highlight is the litter drawer, which allows you to easily fill the IMAC Zuma Cat Litter Tray with fresh litter. It also makes it quick and easy to clean – the tray can be completely removed and the smooth surface can be washed with soapy water. To avoid unpleasant odours, the IMAC Zuma Cat Litter Tray is fitted with an active carbon filter, which ensures fresh air circulates around the room. This and the additional litter scoop can be stored under the hood, and you will find an additional, practical storage compartment in the lid, which is ideal for storing bags for used litter or additional filters. Thanks to the modern design of the IMAC Zuma Cat Litter Tray, in a subtle grey colour, this cat litter box will fit perfectly into every household. IMAC Zuma Cat Litter Tray at a glance: Hooded cat toilet, ideal for larger breeds With comfortable removable litter tray: for easy filling and effortleΒ cleaning, as it can be completely removed Transparent swing door: for easy, quick entry Active carbon filter: neutralises unpleasant odours (1 filter included) Additional storage in hood: offering storage space for litter bags, additional carbon filters etc Includes litter scoop: close to hand under the hood, making it easy to fill and empty the litter tray Retractable carry handle: for easy moving and carrying 100% made in Italy: trendy, modern and perfectly shaped, ideal for all living environments Easy to clean: the smooth surface makes it effortleΒ to clean with soapy water and a damp cloth Colour: stone grey Dimensions: Total: 56 x 40 x 42. 5 cm (L x W x H) Inner: 49 x 36 x 36.5 cm (L x W x H) Entry: approx. 24.5 x 23.5 cm (W x H) Litter scoop: approx. 55 x 37 x 11 cm (L x W x H) Entry height: 13.5cm Storage drawer: approx. 13 x 17 x 5 cm (L x W x H) Please note: Regularly change your active carbon filter to help ensure your litter tray stays clear of unpleasant odours.